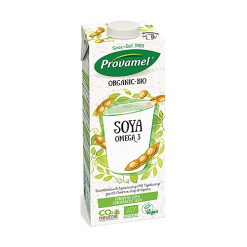 Organic soya milk with linseed oil, providing Omega 3. This organic soy milk is cleverly combined with linseed oil, providing a great source of Omega 3. Ingredients: Organic hulled soya beans, organic tapioca syrup, organic linseed oil, sea salt.